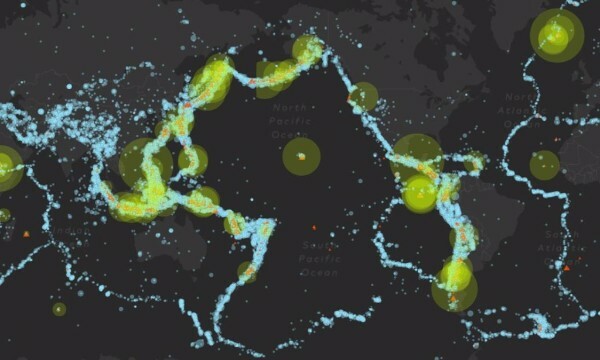 A new web app, developed by DCO's Elizabeth Cottrell and colleagues at the Smithsonian Institution's Global Volcanism Program, shows intimate ties between volcanoes and earthquakes and gives open access to 50+ years of data on quakes, eruptions, and related emissions. Read more about the app and DCO's work on volcanoes around the world. In October 2016, the Alfred P. Sloan Foundation approved three proposals that provide continued support to the Deep Carbon Observatory. Peter Barry (University of Oxford, UK) and a group of early career scientists were awarded a grant, “Biology Meets Subduction: A Collaborative and Multi-disciplinary Deep Carbon Field Initiative.” Robert Downs (University of Arizona, USA) and Robert Hazen (Carnegie Institution for Science, USA) received a grant, “Carbon Mineral Evolution: Deep carbon, deep time, and the co-evolution of the geo- and biospheres.” Peter Fox (Rensselaer Polytechnic Institute, USA) received a grant to support the final phase of DCO Data Science. Victoria Orphan (Caltech, USA) was awarded a MacArthur Fellowship. Many of you will remember her talk, “Endolithic life in methane-derived carbonates,” at the Second DCO International Science Meeting in Munich. Philip Freedman, chair and co-founder of Nu Instruments Ltd (Wrexham, UK), has been awarded an Officer of the Order of the British Empire (OBE) in the Queen’s Birthday Honors. Freedman collaborated with DCO colleagues to design and build the Panorama mass spectrometer, which was featured on the April 2016 cover of the International Journal of Mass Spectrometry. Special greetings to DCO colleagues aboard Drilling Vessel Chikyu, who wrote in a blog dated 20 October 2016, "IODP Expedition 370 introduces a new feature to the history of scientific ocean drilling: a simultaneous interplay between the scientific expedition onboard D/V Chikyu and shore-based microbiological work at the Kochi Core Center using super-clean facilities." We’re about two thirds of the way to our targeted drill depth and the number of samples collected on this expedition is already exceeding 10,000. IODP Expedition 370 is clearly HOT and scientists want samples, many samples! IODP Expedition 370 introduces a new feature to the history of scientific ocean drilling: a simultaneous interplay between the scientific expedition onboard D/V Chikyu and shore-based microbiological work at the Kochi Core Center (KCC) using super-clean facilities. One of the main goals of Expedition 370 is to find the temperature limit of subseafloor life. There are many similarities between this mission and the search for life on other planets. But instead of looking up, we are looking deep down. 5 October: The deep subseafloor (not the sky!) is the limit! Week three of our expedition has concluded. Our status: we have cored through several hundred meters of sediment and are now approaching the Empire of the Hyperthermofiles (i.e. organisms that thrive in extremely hot environments). It’s getting hot down there, which means we are getting closer to our T-limit of life quest. IODP expeditions are about core. There are other things IODP does for sure; working with cuttings, installing long-term observatories, and making downhole measurements and loggings while drilling. But no core, no dice. No core, no smiles. IODPers like rocks and variably consolidated sediments. But mostly rocks. IODPers want core. Last week, the shipboard microbiology team began setting up our core-processing lab. Microbiologists are always concerned about contamination problems, and it is especially true in Expedition 370's search for the limits of life in the deep hot subsurface. When you're hunting for cells that may be as scarce as 6 cells per gram of subsurface material, every potential source of contamination must be minimized. To update you, we are on site and the casing has made its long way down into the drilling site. In this picture, you can see a long casing section making its way 4700 meters down, before being sent another 180 meters beneath the surface. We are anxiously awaiting the first core samples arrival. A large contingent of DCO researchers will participate in the AGU Fall Meeting on 12-16 December 2016 in San Francisco, USA. This day-by-day listing will help you find sessions, talks, and posters of interest to DCO scientists, as well as those featuring members of the DCO Science Network. To add items to these listings, please contact the DCO Engagement Team. In this video, Giuseppe Etiope (DCO Deep Energy Community) addresses the fundamentals of seepage, its potential occurrence on Mars (via microseepage, mud volcanoes, faults, and degassing from serpentinized rocks), and possible detection techniques. Deep Life scientists Verena Heuer and Fumio Inagaki are onboard D/V Chikyu through 10 November 2016 to determine when temperatures become too hot for microbial life to survive below the seafloor and consequently helping to define the depth of Earth's habitable zone. Throughout the expedition, cores will be sent via helicopter to the Kochi Core Center, where a team led by Yuki Morono will analyze the samples. The Cities and Volcanoes Commission of IAVCEI aims to provide a link between the volcanology community and emergency managers, to serve as a conduit for exchange of ideas and experience among people living and working in ‘cities on volcanoes’, and to promote multi-disciplinary applied research, involving the collaboration of physical and social scientists and city officials. View DCO sessions, talks, and posters of interest here. The Deep Carbon Observatory will hold the Third International Science Meeting at the University of St. Andrews. This meeting will showcase recent results from scientists working in all fields of deep carbon research. This workshop is aimed at developing a strategic plan for drilling into the continental crust-mantle transition in the Ivaea-Verbano Zone. In May 2017, JpGU and AGU will hold the first joint meeting of the two societies covering all areas of the Earth and space sciences. More than 50 sessions will be presented in English for inter- and trans-disciplinary scientists. The Department of Geology at the University of Georgia seeks to fill a position for a tenure-track assistant professor in the field of petrology/mineralogy, welcoming applications from scientists in both the Earth and planetary sciences to complement the department’s growing focus in planetary sciences. We encourage applications from petrologists/mineralogists with strong backgrounds in chemistry and physics who may employ unconventional and interdisciplinary approaches to address big-picture questions including but not limited to petrologic and/or mineralogical aspects of planetary evolution involving core, mantle, and/or crustal processes. Open until filled. The Department of Earth and Environmental Science and the Center for Energy Research at the University of Pennsylvania seek graduate students interested in any of the following research areas: geomicrobiology, ecology, microbe-microbe and microbe-mineral interactions, biogeochemistry, ecophysiology and bioenergetics. The successful applicants will be awarded a PhD Fellowship package that includes: tuition, fees, health care and stipend for living expenses. These packages are available starting Fall 2017. “Pretend that you're an alien in a spacecraft above Earth. You are looking down and watching the pulse of planet Earth. The breath, the respiration..."
ERRATUM: Some readers of the DCO Newsletter may have noticed a glitch in the September 2016 issue. If your email settings prevent image display, your newsletter contained a piece of linked text that took you to the incorrect article. We have now fixed this problem and apologize for any confusion. We always welcome feedback on the DCO Newsletter. Please email Katie Pratt of the DCO Engagement Team if you have any comments or suggestions.